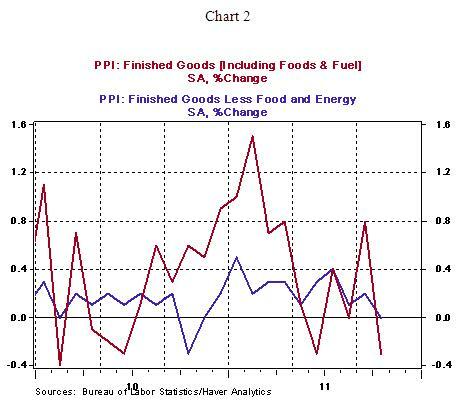 The Producer Price Index (PPI) of Finished Goods fell 0.3% in October after a 0.8% jump in the prior month. A 1.4% drop of the energy price index was responsible for about two-thirds of the decline in the wholesale price index. 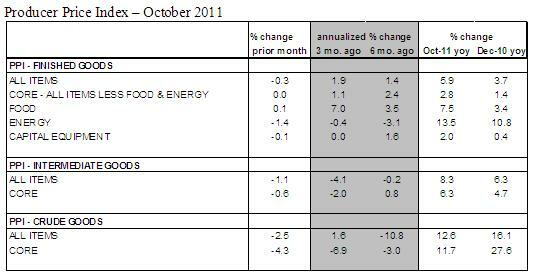 The core PPI, which excludes food and energy, held steady in October after ten monthly gains. Lower prices for cars and trucks offset price hikes of other core items. At the earlier stages of production, the core intermediate good price rose 6.3% from a year ago. This represents a decelerating trend following an increase of 7.8% in July (see Chart 3). 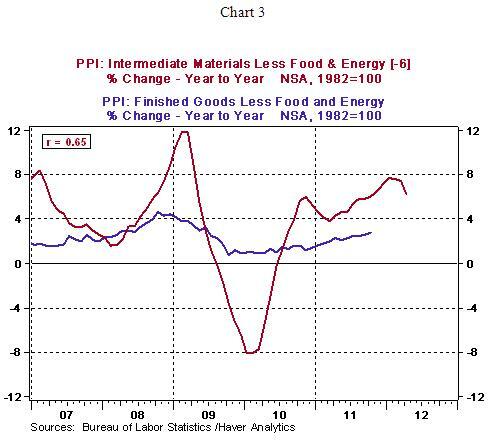 It is important to note that the core intermediate goods price leads the finished goods core price index by six months. In other words, the current moderation of core intermediate prices points to a likely moderation in the finished goods price index in the months ahead.